Black Book interviews Mad Men's Elisabeth Moss about Peggy and Don's relationship, her love of large-chain clothing stores, and what it was like working with Sarah Jessica Parker. Because it's impossible to go a single day without contributing to the Mad Men Frenzy, here are some quotes from a new interview with Elisabeth Moss in the new Black Book. There are no big huge revelations, but I like how you can almost hear her speaking in her careful, measured way. As usual, she sounds very smart and very down-to-earth. I just wish they had asked her about her relationship with the Church Of Scientology, because I think a lot of fans are curious about that aspect. "On any other, lesser show, you would have had that happen on the first season, but with us, it's touched upon in the very first episode-and then completely buried in favor of a far more interesting sort of friendship, more protégée-type relationship." "We know everyone at the network; we're actually friends, and we've seen them and hung out with them and been with them from the beginning, so it feels like it's a much more familial relationship." "I'm a huge proponent of Urban Outfitters-I adore them and adore their website and consider it my personal closet much to the detriment of my checking account. I don't have a lot of time to go shopping honestly, and when I do, I'm not a huge designer girl. I'm very like I like the Gap and J. Crew and Urban Outfitters." "I've done two films this year. One's Did You Hear About the Morgans?- it's a romantic comedy, I play Sarah Jessica Parker's assistant. It really fun to do that kind of comedy, which I've never really done-very light, snappy, you feel like you're in an old 40s movie. I'm a huge fan of Sarah Jessica Parker's, so that was a dream come true to work with her. " "Mad Men is so minimal, and nobody ever really says anything-you have five lines, and it's all very quiet. Then you go to doing 10-minute takes of something that's so comedic where everybody's improv-ing and coming up with ideas ... it was so black and white." 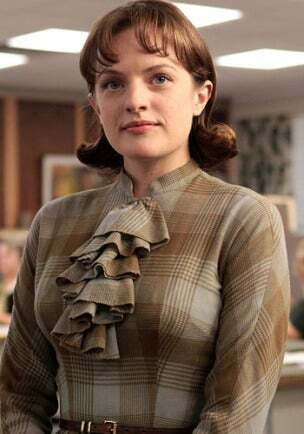 Black Book: "Before season two of Mad Men started last year, I was talking to costume designer Janine Bryant; at the time, she described Peggy's look as a "schoolgirl in the office" who is "buttoned up" due to her conservative nature. One of the questions I asked her about each character in turn was what she thought a contemporary version of that character would wear. What she said for Peggy Olson was "Marc Jacobs ... Maybe a little bit of Burberry." Elisabeth Moss: "Oh, that's very good." Black Book: "What else would the Peggies of 2009 wear?" Elisabeth Moss: "I could not possibly improve on that. Maybe a little bit of Calvin Klein mixed in ... just the sort of simplicity and professionalism of it, but that's wonderfully put. In fact, there's a dress that I wore this season that seriously could be Marc Jacobs. You could sell it off of the rack." Ugh to that part. First off: Peggy Olson is in no way known for her sense of style in the world of the show (remember that totally ridiculous gay guy makeover scene? ), and since the show took place before irony, she couldn't have been doing that trying-to-look-frumpy-on-purpose Marc Jacobs thing. It's just a really circular argument. Marc Jacobs is inspired by dowdy ladies from the 60's, not the other way around! But it's not like she could disagree with the show's costume designer. Anyway, I love that Elisabeth Moss, the famous movie star, shops at The Gap and Urban Outfitters and J. Crew, and I actually believe in this case it's not a sneaky celebrity trick to sound relatable.